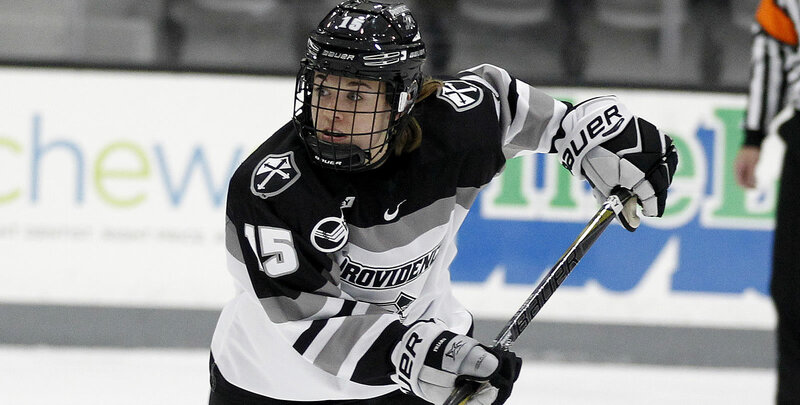 PROVIDENCE, R.I. - The Providence College women's hockey team defeated Concordia University, 6-1, in an exhibition game on Friday, Sept. 28 at Schneider Arena. - The first period ended in a scoreless draw, with each team recording five shots on goal. Madison Myers (Colchester, Vt.) made five saves in her 20 minutes of action. - The second period featured four goals and seven total penalties. - Cassidy MacPherson (Oakville, Ontario) got the scoring started for the Friars. Maureen Murphy (Buffalo, N.Y.) played the puck to Sara Hjalmarsson (Bankeryd, Sweden) who left a drop pass on the slot for MacPherson to finish. - Just three minutes later, Providence doubled its lead on the power play. Hjalmarsson again picked up the assist by playing a nice cross-ice pass to Murphy, who sniped the top left corner. Whitney Dove (Port Moody, British Columbia) picked up the secondary assist. - The Friars tallied another power play goal at the 14:19 mark of the middle stanza. One-touch passing through the zone led to a one-time finish from Hayley Lunny (Bedford, N.Y.). Neve Van Pelt (Mitchell, Ontario) and Meghan Rickard (Coventry, R.I.) had the assists. - Just over a minute later, Concordia cut into the lead. Rosalie Begin-Cyr picked up a rebound in front and put it past Clare Minnerath (Sartell, Minn.). - Kate Friesen (Altona, Manitoba) became the fourth Friar of the day to score with a shot from the point. It deflected off a defenseman and found the back of the net. Avery Fransoo (North Battleford, Saskatchewan) and Murphy earned the assists. - MacPherson got her second of the night at the 15:48 mark of the third period. She skated down on a 2-on-1 with Murphy, elected to take the shot herself and slipped it past Madison Oakes for the 6-1 lead. - Providence had five different goal scorers and had nine different players register a point. The Friars open the regular season with a two-game series at home against Bemidji State. Puck-drop is set for 6:00 p.m. on Friday, Oct. 5 and 2:00 p.m. on Saturday, Oct. 6.